Experience the golden standard in portable cleaning tools with the RYOBI 18V ONE+ project vacuum. The robust yet compact design delivers all the power you need for any cleaning jobs. Simply plug in any 18V ONE+ battery and you’ll have 75 air watts of pure power on your hands. That translates to 24 litres of air every minute in air flow. And with the flick of a switch, that power can be diverted from vacuum to blower – it can even be used as an inflator with the included adaptor. All this power comes with the pinnacle in convenience and safety. 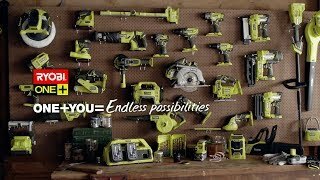 The on-board hose and accessory storage make moving the RYOBI ONE+ project vacuum simple. For a wide range of vacuuming and inflating applications, each project vac comes with all the adaptors and nozzles you’ll need. And to make vacuuming plaster dust, allergens and other hazardous materials safe, also included is a washable HEPA filter. The RYOBI 18V ONE+ project vacuum has set the benchmark in portable vacuum solutions. Grab your RYOBI 18V ONE+ project vacuum from your local Bunnings Warehouse today.